Russian Yeti: The Killer Lives chronicles American explorer Mike Libecki as he investigates why nine college students hiked up the icy slopes of the Ural Mountains in the heart of Russia but never made it out alive. The students' bodies were found scattered across the campsite in three distinct groups, some partially naked and with strange injuries including crushed ribs, a fractured skull, and one hiker mutilated with her eyes gouged out and tongue removed. Dr. Jeff Meldrum made himself available to talk with Bigfoot Lunch Club about the Discovery special. In part one of the interview we discuss the difference between the Himalayan Yeti and Russian Yeti. In the second half of the interview (posted tomorrow) we talk about the definition of progress in Bigfoot Research. The volume in the audio above, but at least you can hear our interview with Dr. Meldrum's interview unedited in full. below is a quick transcript. GE: First off I just want to say I’m a big fan of your Legend Meets Science, I think that’s a staple in every cryptozoology library and I also like your Sasquatch Field Guide that you have out, that’s one of the best things since sliced bread for bigfooters. JM: Well good, I appreciate that too. GE: So I want to get a couple things defined regarding the difference between bigfoot and yeti. So these are, are these the same creatures adapted to different climates or are the differences more distinct? JM: Well, one has to first clarify what you’re referring to when you use the term yeti, because in Asia for example, in Russia the term is used quite generically for the Russian Wild Man and that entity or entities may take on more than one identity, in my opinion. There’s very interesting evidence suggests that there’s a creature much more human like than what we, at least what I, attribute to the North American Sasquatch. This creature is described as being man-sized but yet covered with hair often with differentiated head hair, frequently described as utilizing tools stone tools in fact not just opportunist brandishing sticks and such. And Even interacts with the locals in a much different way as more complex social structure larger groups of individuals, and sometimes trying to interact trying to trade, even to communicate with the local inhabitant who simply consider them to be sort of backwards people that live up in the mountain. Their foot prints from my perspectives are quite interesting in that they are much more human like, they have an arch, that they are very broad very splayed, a foot that suggest a much more robust skeleton not just someone whose gone without shoes but much more robust skeleton, so in part of that basis of description and foot print characteristics I would suggest that this is a relict Neanderthal or an affiliated species maybe like the Denisovans. GE: Wow, so this would be totally different than the yeti that Sanderson had looked for or what Thom Slick had funded during his expeditions. JM: Right, right so the yeti to us, to most Americans, if you use the term yeti that invokes the notion of something in the Himalayas and what evidence exists for a species in the Himalayas at least in the high valleys of the mountain passes where the footprints have historically been found by mountaineers and attributed by the sherpas to yeti. It appears to be a creature that is much more ape like, again about man sized heavy stocky but the best footprint evidence we have suggests a foot that has a divergent big toe in much more ape like fashion than a hominid or human like fashion. So now the picture again gets a little bit more complicated or interesting because when Josh Gates the host of Destination Truth went up into the Himalayas while they were scouting about at some of the lower elevations some of the forests or the foothill they had reportedly had an encounter, heard something splash through the creek and run out across a sandy gravel bar and left a string of footprints which he made several casts of one was a very complete foot print which he brought to the laboratory here and I had the chance to look at and I was able to immediately able to walk over to one of my drawers and pull out a Sasquatch track that was almost identically to it. JM: One that came from the blue mountains up by Walla Walla Washington. So there is the possibility there is also in the foothills of the Himalayas and extending into some of the areas where this Neanderthal has been described, one of the hot spots if you will, has been the Caucasus Mountains spanning between the black and cascades season. It has been produced through the efforts of people like Mary Jane Coffman a number of very good and well documented examples of Neanderthal like footprints or sub human or I should say archaic human footprint. But also in my recent trip to Russia which was quite interesting I linked up with an investigator by the name of Dimitry (???) one of the most interesting aspects of that trip we were following up on the report of a long line of tracks that had been witness by many people in the local village and these were 16” tracks that were again indistinguishable from Sasquatch tracks but quite different the little you know 9 to 11 inch very human like arched footprint that have been more attributed to the more Neanderthal-style Russian Wild Man. So it’s not just, in fact I was happy to hear that you really liked the field guide I’m in the process of writing another field guide that addresses this very issue; the notion that there could be multiple relic hominoids species, some more man like the Russian Wild Man or some more ape like the North American Sasquatch but which has apparently the equivalence scattered across eastern and southern Asia. GE: Yeah, that would be exciting to have because I think one of the things that non bigfooters find really compelling as you have noted before in your presentations, the earth was literally the Planet of the Apes for a little while. We had multiple bipedal creatures walking on the earth sharing different geographies and such. JM: Exactly, and that seems to have been the rule rather than the exception in the past where there were you know as many as six or seven multiple species of hominid or hominoid depending on which taxonomic level you’re looking at but things that have or close allies to the branch that ultimately gave rise to human modern human and you know that the idea that we’re the last hominid standing kinda flies in the face of that rule and one has to ask why would the present be an exception. JM: Diminutive hominoid on this island that the natives were talking about in such a similar fashion as they do here in North America. You know? The history of the indigenous people are replete the histories replete with stories of wild men that inhabited the forest. GE: I think that if media is any indication, there’s a general consensus that there’s something to bigfoot research or there’s definitely a large interest in it, is that the same in the academic world or is it the academic world catching up? You know and its funny you mentioned that Ivan Sanderson and I feel guilty too if I don’t give credit where credit is due but I’m finding myself going full circles back to his original thesis back in the early 60’s that where he identified at least four different types of he called them ABSN’s abominable snowmen but we have the sasquatch type, we have the Neanderthal type, we have the little he called the proto-pigmy but what we maybe would think of as relic Australopithecines very early homo and the ape like type in the Himalayas and so you know I don’t want to I’m not one to necessarily lump everything together nor am I one to spit into too many different entities as some have done in the recent past but I think that that’s a really pretty good working model to begin with I find that there’s some differences, some of the evidence that he was willing to accept I would raise some questions about and limit maybe the distribution of some of those more as there relatedness to one another but never the less that fundamental that’s taken in its broad brush strokes of multiple hominid species on the planet today just as Sanderson had suggested 50 years ago half a century ago is really starting to take some root. GE: Well and that’s really interesting because your also one of the people that would suggest that there may not be multiple species of bigfoot in North America. GE: Right and I think that’s why it’s significant that when you say that there might be something to Sandersons mulitiple species and then in North America maybe not. So on Sunday June 1st Russian Yeti: The Killer Lives airs on the Discovery Channel, can you tell us a little bit about your involvement in that show is? JM: Right, yeah well it was primarily from my spear of experience and expertise you know that the antidote or the incident described that did the basis for that title, which I had nothing to do with I’ll give a disclaimer right now, is an intriguing one and I was curious to discover that there is quite a cult of a following of this particular story and the various theories to what might have accounted for the outcome and you know the link to the Russian Yeti or Wild Man is a tenuous one at best but it is an intriguing one and you know it does raise this question of do these creatures pose any threat to modern humans when they venture out away from civilization into the wilderness you know there’s always the questions that’s raised about sasquatch and its behavior whether it is a threat whether it is antagonistic or predatory on people and a lot of discussion has been has ensued around that we have anecdotal evidence some of the classic stories like that Bauman incident shared with Teddy Roosevelt. that's the end of Part 1. Stay tuned tomorrow for part two of the interview, when Dr. Jeff Meldrum discusses the two-hour special in more details and then discusses how we define progress in Bigfoot research. 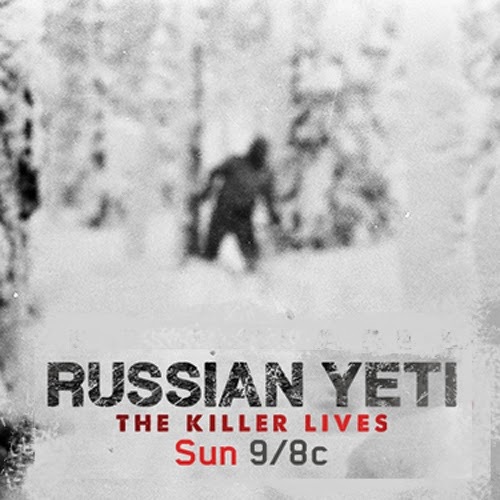 RUSSIAN YETI: THE KILLER LIVES is a 2-hour special airing Sunday, June 1 at 9 PM ET/PT on the Discovery Channel. He isn't "lending his name to this BS." In case you aren't paying attention, he states the same theories he always has and he pays the BS no mind. By keeping his focus on what actually is a possible theory, he is helping to get real scientists to begin to accept that there are things that need to be investigated. By dismissing his talk, just because of the platform he is using, you are one of those people ! Dr Quack quack... wasn't Discovery supposed to be a real documentary making network??? They ruined their credibility to the point of any real documentaries on their network can never be trusted again. Guess the MTV styled reality tv ratings are too good. the subject matter is interesting but this is clear attempt by Discovery to paint anyone interested as a nut. Discover the Mocumentary trend. Discovery may have found ratings this way but I will avoid anything with their name attached. Is that OK Anonymous?